This photo is a neck which has been largely shaped on the Fadal. You can see one section where the neck is still rough. 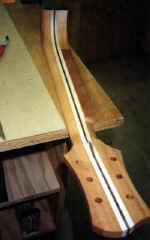 When the machine is done the entire neck -- peghead, machine holes, volute on the peghead, shaft of the neck and the heel are complete and need only a fine sanding to be ready to attach to the guitar. The computer can be programmed for necks of different width and profile, depending on the customer's wish. 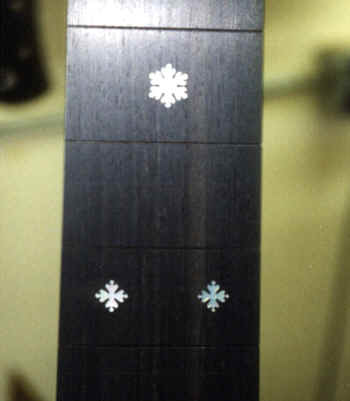 Jim's tooling enables him to inlay even small and complex shapes such as these with virtually no gaps to be filled. 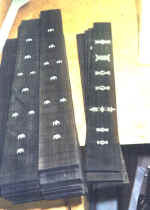 A stack of fingerboards ready to be fretted. Most have Jim's signature Dove inlay, and several have an elaborate Celtic design done by Larry Robinson. 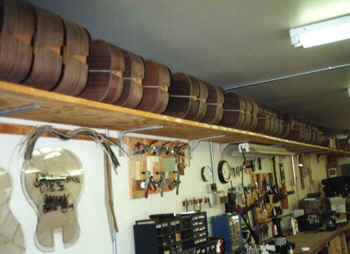 Five rims of Brazilian rosewood and one of highly figured Koa. 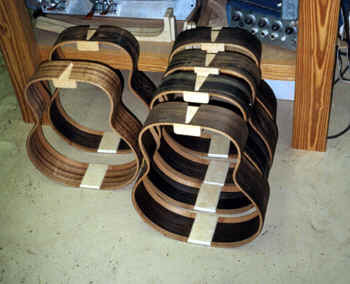 Note that Jim uses a Baltic Birch plywood for his tailblock. Jim does this because so many guitars these days have one or more jacks for onboard pickups, and Jim feels that this gives added strength and protection if a guitar falls on the plug sticking out of the jack ( a common cause of cracked tailblocks and ribs). 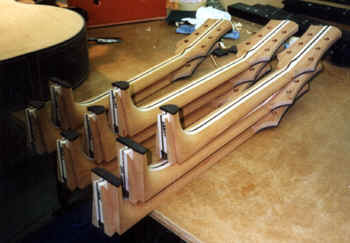 A stack of X braces fully shaped and ready for gluing to the top. 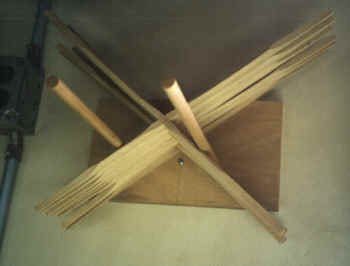 Jim uses his vacuum clamping jig for this. A stack of necks, shaped on the Fadal, ready for fingerboards. One wall of Jim's shop with approximately 30 bodies in various stages of construction. Jim's spray booth. 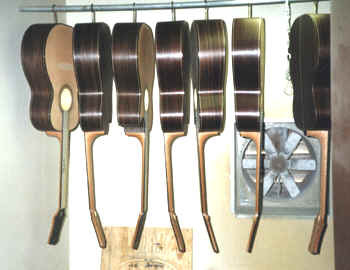 These guitars have had paste pore filler applied and are ready for the next step of the finishing process.